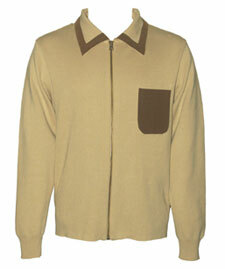 Aertex has added some new stock to its site, most notably new shirts, but most interestingly, some Gabicci-style knitwear. This particular top is available in three colours – burnt orange, black and the stone featured here. The downside is what seem to be the wrong details on the site – this isn’t the ‘short sleeve knitted button through shirt with two front patch pockets’ as described. As such, I can’t give you specific details on material or indeed price, though I suspect the £42.51 (excluding VAT) is correct. If you want one, drop them an email or call them to find out more – they are very easy to deal with. Grabbed myself an Aertex knitted shirt. A bit pricy and not much change from £50. It’s ok but I feel there are more authentic shirts out there. Better prices too. Aertex sort of reminds me of what my Grandad wore.